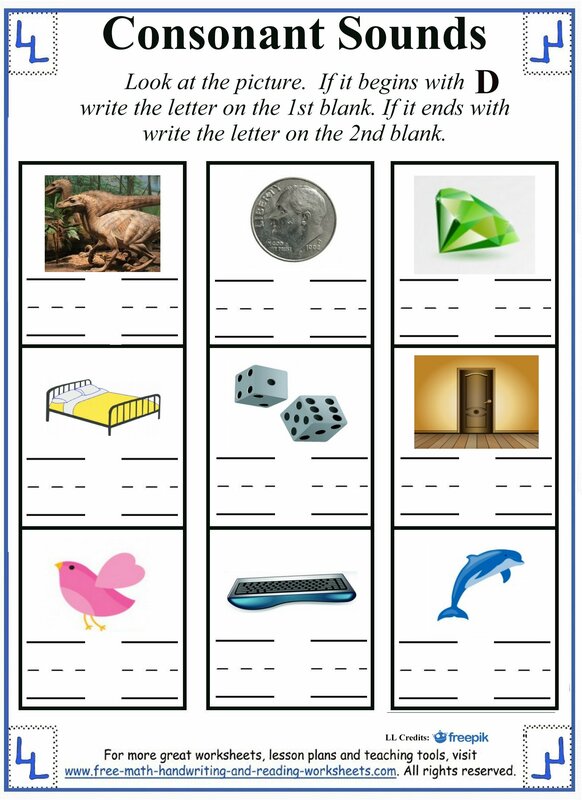 Moving on with the consonant letters, I've created this set of D letter worksheets. If you have already worked through the previous letter worksheets, then these will seem familiar. 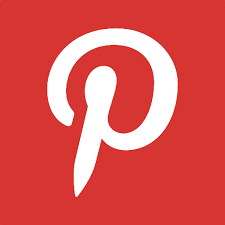 I try to stay consistent among the various types of worksheets that I create. Some children respond better to writing tasks, while others prefer coloring and naming activities. Our daughters have always enjoyed the coloring sheets and cutting tasks more than writing, while our son takes to the reading and writing activities. Whatever your child's preference, you'll find a bit of everything here. Click on an image to open up a printable file in another window. 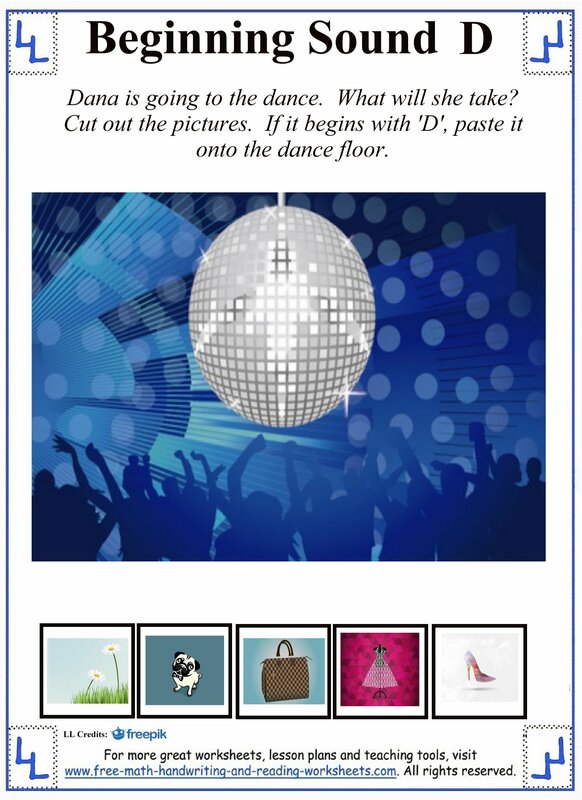 The first worksheet asks your child to cut out all of the pictures. Then he or she will need to glue the objects that begin with D (dandelion, dog, dress) onto the paper. Next is a simple paper for Preschool children. 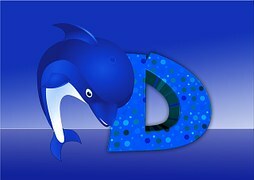 It introduces the letter D and a word. Say the letter and the word then circle the objects that begin with D (dog and dragon). The next activity is great for older children that are beginning to learn how to read and write. You'll see three pictures next to a set of four words. 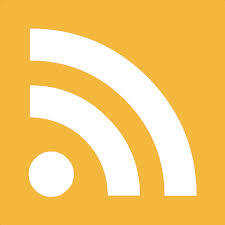 Circle the word that best describes the picture and then write it on the line. Then you'll find a rhyming activity with four words at the top. Below are four more boxes with a single word inside. 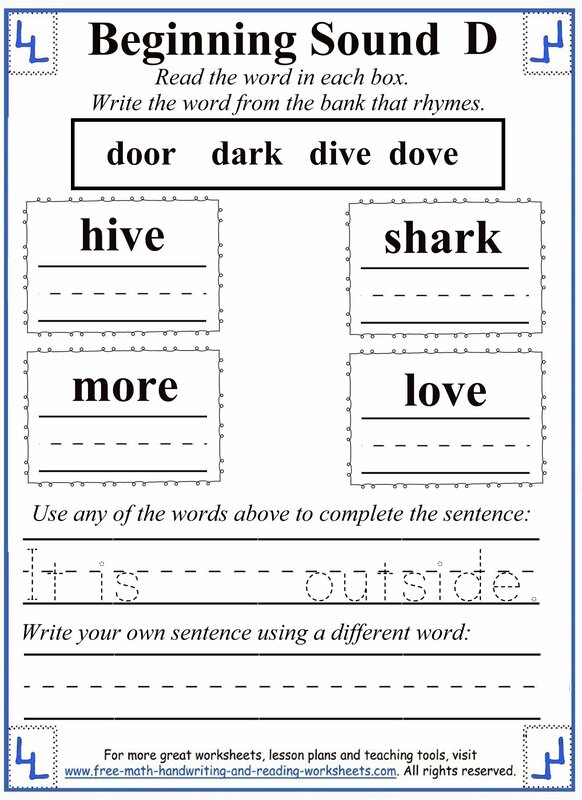 Write the word that rhymes in each box. 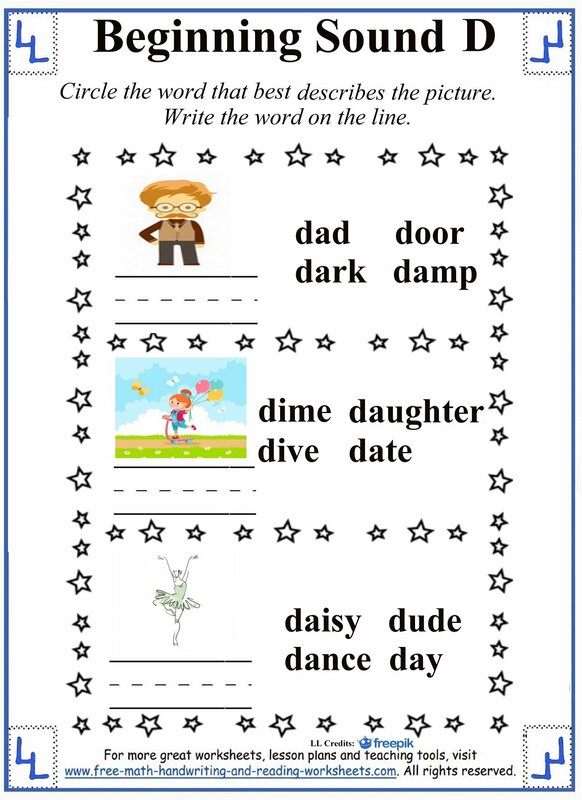 Use one of the 'D' words to complete the phrase at the bottom and use another to write an original sentence. 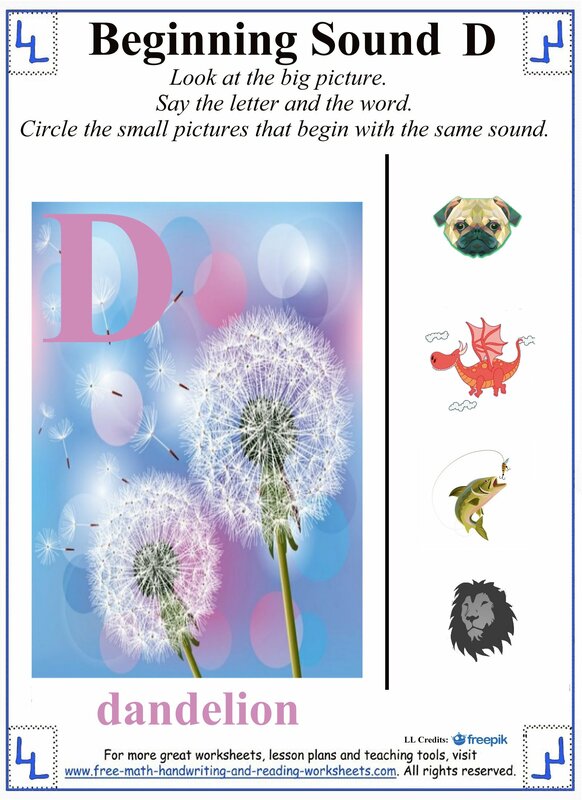 The 'Consonant Sounds' paper will teach your child about the beginning and ending sound /d/. Look at each picture. 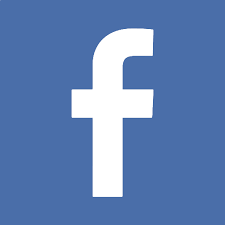 If it begins with D, write the letter on the first line. If it ends with D, write it on the second line. 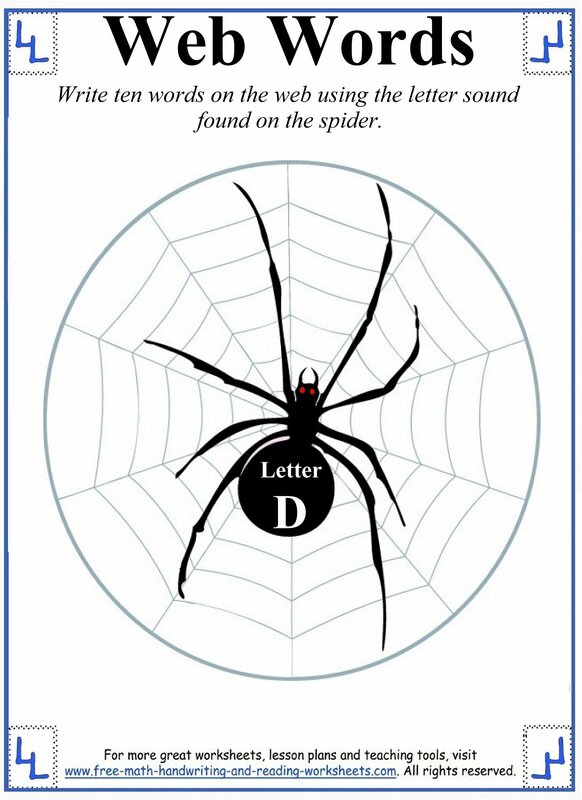 In the final worksheet, your student needs to come up with ten words that begins with the letter D. Write one word on each section of the spider's web. I've covered the individual letters in other lessons including alphabet coloring pages, letter tracing, and handwriting worksheets.